Monaco, officially the Principality of Monaco is a sovereign city-state and microstate located on the French Riviera in Western Europe. Monaco shares borders with France on 3 sides and the Mediterranean Sea on the other. Monaco is the second smallest country of the world (after the Vatican). Monaco has an estimated population of 37,800 and it is the most densely populated country in the world. Monaco is a well-known country around the world due to its status as the playground for rich people. Similarly to Zürich and Genova, 30% of Monaco’s population is made up of millionaires. 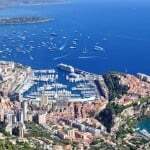 Monaco is also a tax haven, as the country does not have an income tax, which made it a popular destination for wealthy Europeans. Gambling has a rich history in Monaco. The first casino (the famous Le Grand Casino de Monte Carlo) was opened in 1858 by Francois Blanc, the inventor of roulette. Gambling is legal for tourists only* and the industry thrives there with many casinos operating successfully. However, local citizens are not allowed to play in the casinos. Although gambling is illegal for citizens of Monaco, they can play online in foreign online casinos, because online gambling is not regulated. One of the world’s most famous casino is in Monaco, the Le Grand Casino de Monte Carlo, which became a gambling mecca for Europeans in the 19th century. The casino opened its doors in 1858 and it is in operation ever since. Due to the success of the Le Grand Casino de Monte Carlo, many casinos opened the following years so today there are numerous casinos operating in Monaco. However, residents of Monaco are not allowed to play in any of these. Monaco does not regulate online gambling. Therefore players from Monaco are accepted in many offshore online casinos. Bingo is a well-known form of gambling. However, it is not very popular in Monaco. The gambling law of Monaco does not mention bingo at all. Online gambling, in general, including online bingo is not regulated. However, players from Monaco can play bingo online at many foreign bingo websites. All the famous casinos in Monaco have poker tables. Poker is legal. However, online poker is entirely unregulated in the microstate. Monacan players are accepted at many foreign online poker platforms if they want to enjoy poker from the comfort of their homes. Monaco is known worldwide for The Monaco Grand Prix. It is one of the most prestigious races in the world and it occurs on the streets of Monaco. Football is another popular sport in Monaco. Monaco’s team, AS Monaco FC competes in the French league and the team is quite successful However, Monaco is not a member (the only one, besides the Vatican) of UEFA so the country does not participate in any World Cups of European Championship tournaments. However, there are no bookmakers operating in the country. The gambling law of Monaco is also unclear on sporst betting. The only way citizens of Monaco are able to bet on The Monaco Grand Prix or their own football team is by visiting an international bookmaker website. Online gambling, including online sports betting is not regulated, so players from Monaco can bet on sports at many online sportsbooks, where they are accepted. People from Monaco can also purchase lottery tickets from foreign online lotteries and lottery agents. There aren’t any specific laws regarding Bitcoin gambling in Monaco as of now. An overview of the legal status of gambling, online gambling, sports betting, poker, online casinos, bingo and Bitcoin gambling in Monaco. Hi. DO you know which casinos have the most favorable odds for 2 deck blackjack in Monaco and NIce with a minimum bet of 20 EUD or lower? Thanks. Sadly, I don’t know. Hopefully a visitor can answer your question.